You might wonder what we are doing in upstate New York near Syracuse when we said we were on our way home. Our trip home has turned into a rescue mission. Helen is the president of Green Mountain Pug Rescue, a 501(c)(3) organization dedicated to rescuing pugs in need. 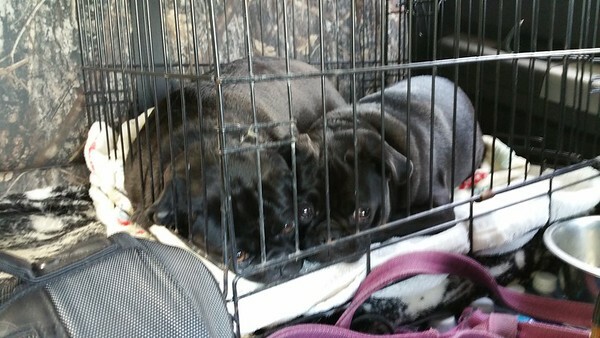 She got an email from a family who have some illness issues and need to surrender their two pugs. So instead of spending a day in the Lancaster, PA area reliving 35+ years ago we are in upstate NY to pick up two pugs in need and bringing them back to Vermont where they will be evaluated for personality and medical issues (if any) and then fostered until an approved permanent placement with a forever home and family can be arranged. Rescued! 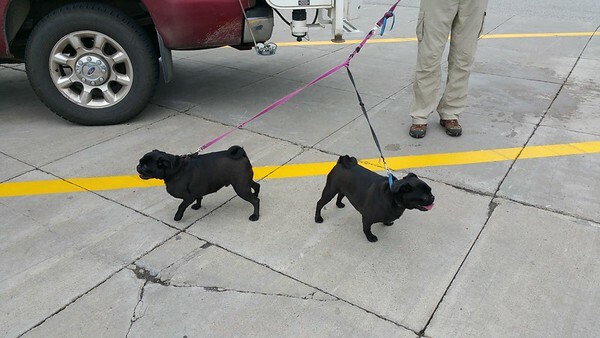 Louie and Ralph, pugs on their was to Vermont and new forever homes. For anyone interested in this part of upstate NY, Green Lake is a lovely campground with large, private sites, lots of woods and some wonderful hiking and biking trails. Highly recommended. 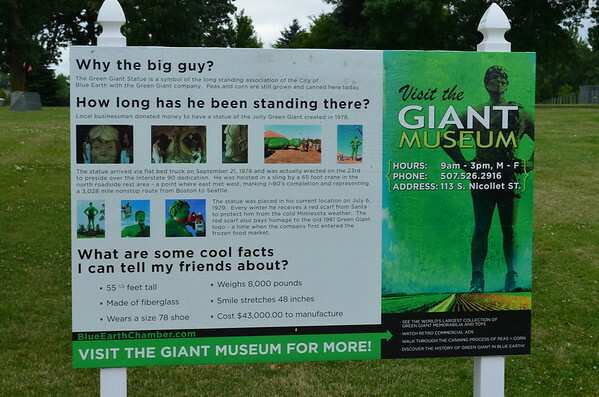 Stay tuned for a postlude – facts and figures about the trip. So you ask, where have we been since the last post? It’s really quite simple. 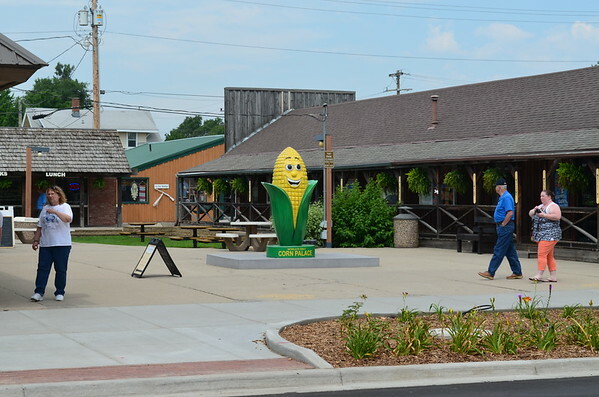 We have been pushing across middle America, where there is lots of corn and lots of flat land. From Rock Cut State Park we traveled south of I39 to I74 and then east to I70. One on I70 we traveled around Indianapolis to a busy little campground and resort on the east side of Indianapolis and just north of I70, Cornerstone Campground and Retreat. The campground was filling up fast when we arrived Friday evening and has been having lots of problems as a result of all the rain they have been getting. While we would normally boondock, the 85-90 degree weather has us seeking shelter in the form of electric hookups so we can run the AC and cool the camper down. There are no pictures because, frankly, there wasn’t much to see but flat land, corn and more corn. We did stop at the REI in Indianapolis to exchange a hat for Helen. As usual, REI’s customer service is second to none and the exchange was done in minutes. 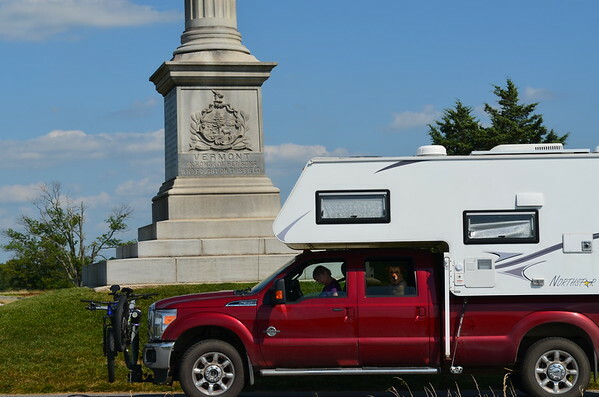 On Saturday we pushed again to make time across the midsection of the country and went from the Indianapolis area through Ohio and made it a short way into Pennsylvania. We decided we would boon dock at the Cracker Barrel in New Castle, PA but after an hour of steady cacaphony from the interstates that intersect there we decided to move along to what appeared to be a safer choice, the Walmart in Latrobe, PA, just a few miles up the road. What we thought would be a nice quiet spot turned out to be the Saturday night hangout for the motorcycle and hot cars gang from Latrobe and parts thereabouts. From 2200 to 0030 we were treated to squealing tires, firecrackers and loud pipes on chopped motorcycles. Not a good sleeping night! The morning evidence of the evening hooliganism. But we never felt threatened or unsafe. 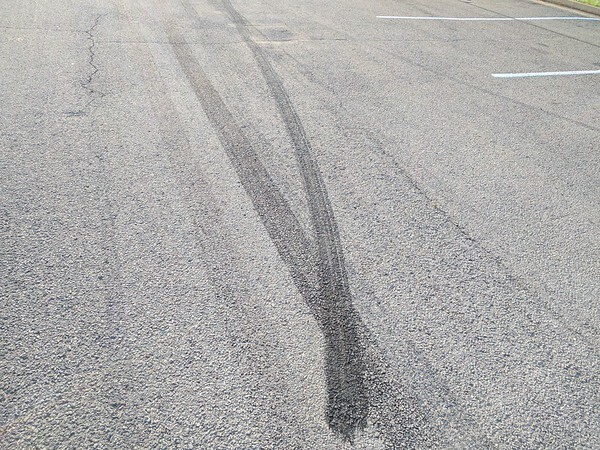 They were loud and foolish but weren’t really harming anything other than the quiet of the evening and their own tires. 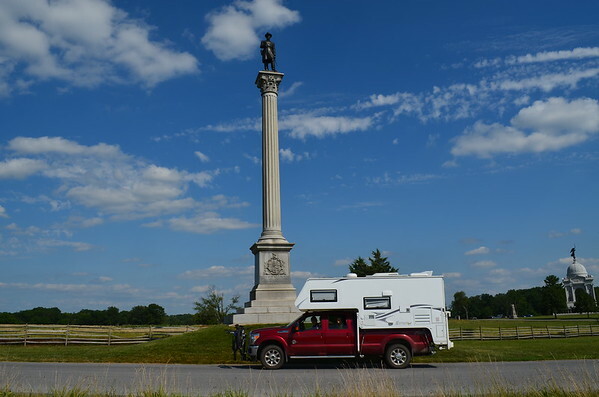 From Latrobe we traveled PA 30 to Gettysburg where we are this evening, in Artillery Ridge Campground on the edge of the battlefields. 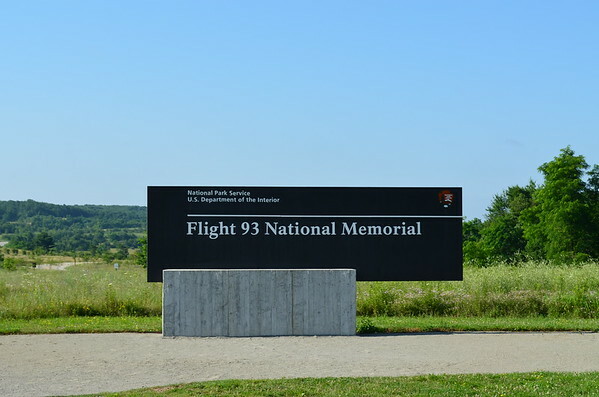 On the way to Gettysburg we unexpectedly came across the Flight 93 Memorial and stopped to pay our respects to the brave souls who lost their lives bringing Flight 93 down before it could complete its mission to crash into the Capitol. 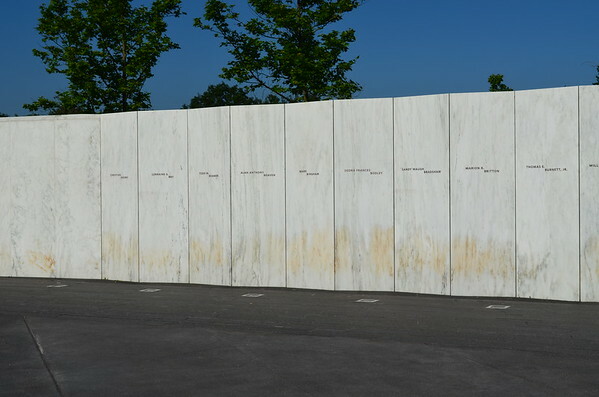 Each white panel is engraved with the name of one of the passengers from Flight 93. 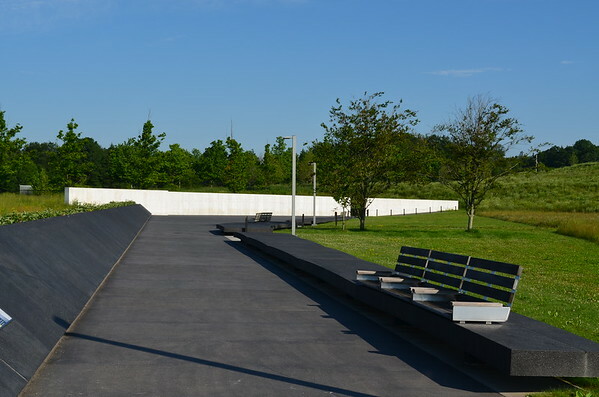 It is a somber and moving place, reminding me in some ways of the Vietnam Memorial. Different wars, different memorials, same results – death, sorrow and destruction. 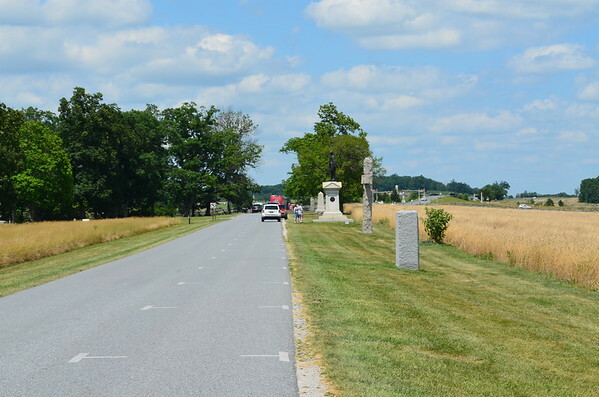 We made it to Gettysburg around 1100 and decided to try to do the battlefield tour today rather than waiting until tomorrow, where thunderstorms are in the forecast. 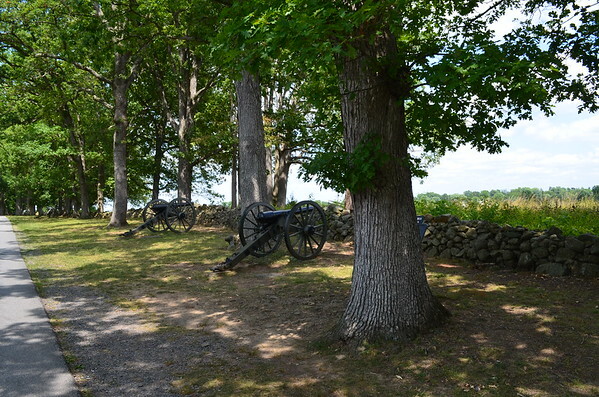 We purchased a CD and did the battlefield tour with the CD narrating the various events of the Battle of Gettysburg. 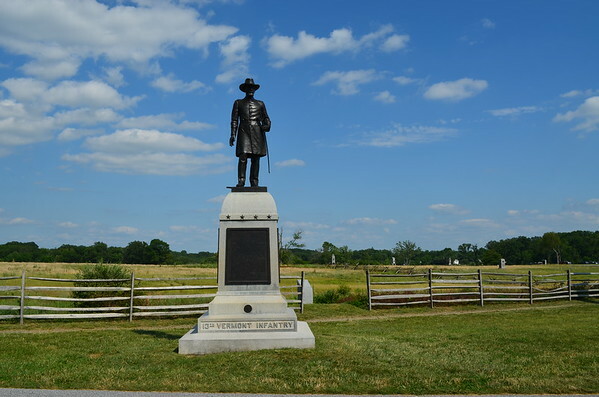 The casualty figures for the three day battle are staggering – 51,000 soldiers fought and died at Gettysburg over three days. The carnage is hard to imagine. But we found the tour educational as well. And at the end of the day it would take many more days than the short time we have left on our journey to truly explore all the aspects of this great turning point in the Civil War. 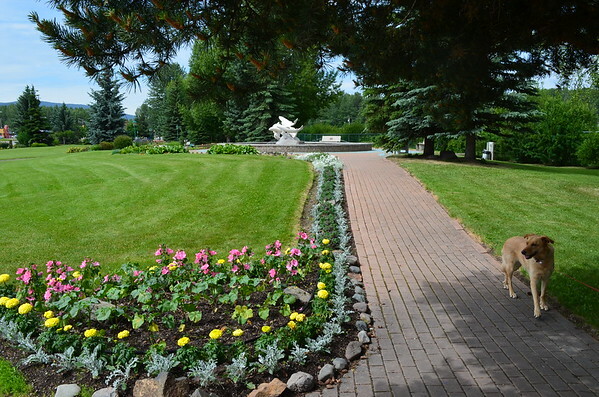 While it is peaceful and bucolic now, it isn’t hard to imagine the chaos of the war. 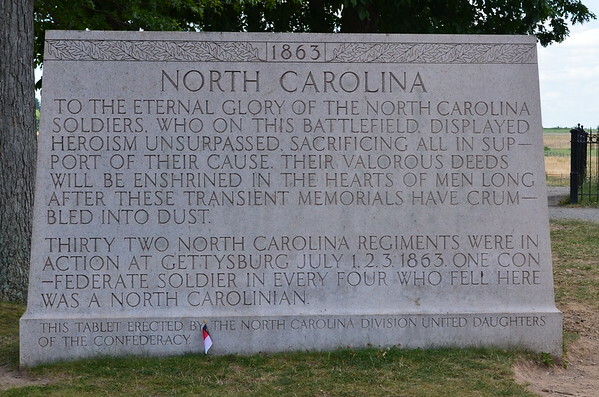 There are monuments and markers everywhere tracing the ebb and flow of the battle and the units that were involved. The losses on both sides were staggering. 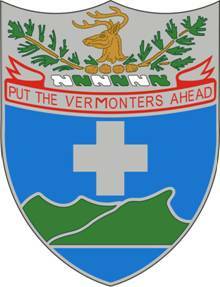 The 172nd Infantry of the Vermont Army National Guard carries on the tradition by keeping that phrase on the unit crest. And Vermonters have served in significant numbers in every conflict since. Tomorrow we begin to turn north and start the journey home. 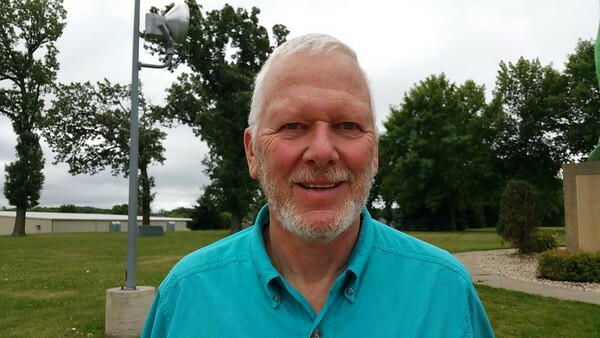 We have no designated destination for tomorrow but hope to pass by the Lancaster area on our way to visit a smorgasbord in the Penn Dutch country as a way of remembering a romance that was kindled over 38 years ago in this same area and that still burns strong today. Today was a three state day and 350 miles. Minnesota, Wisconsin and now Illinois. 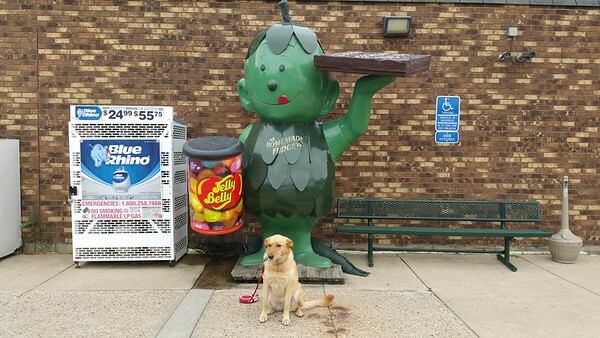 The day started off with a visit to the Jolly Green Giant and Little Sprout. Sprout and Ginger, the wonder dog. 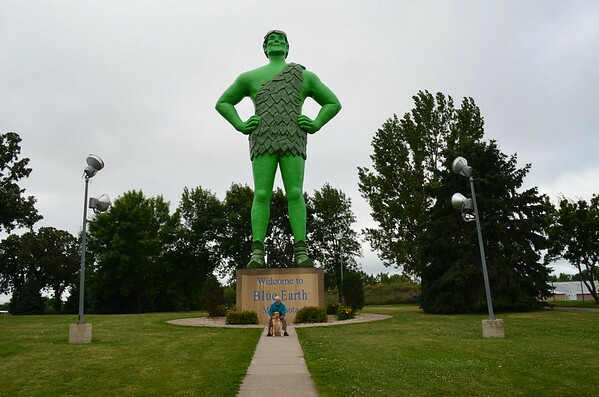 This a significant tourist draw for Blue Earth, MN. Don’t believe me? Look it up on Google Maps. Of course Sprout would be lonely without the Giant. 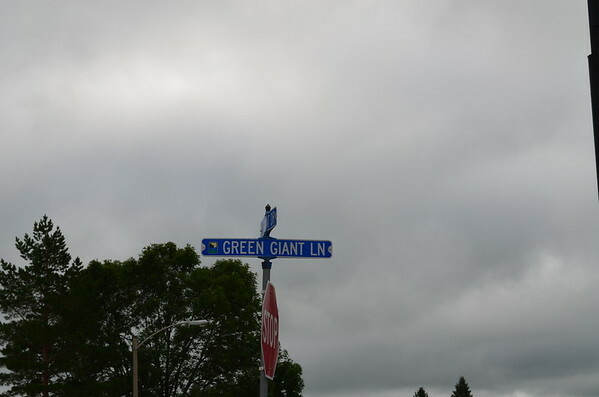 Of course the Jolly Green Giant has scored his own street. 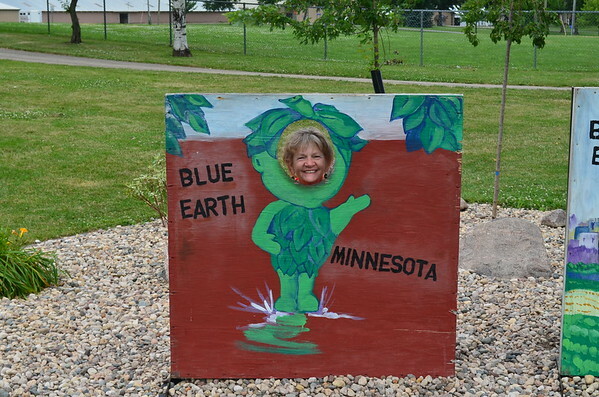 And here he is, the major draw for Blue Earth. Of course there is an opportunity to ham it up, so we did. 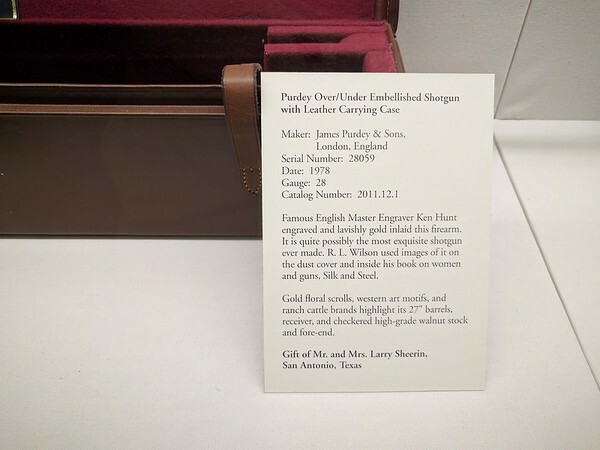 And for those who want to know, here is the backstory. Presented by a somewhat more hirsute me. Two days in a row with cell service. We must be back in civilization! 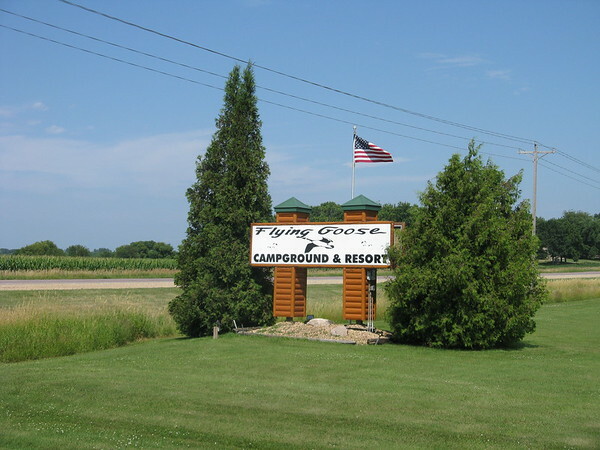 We are at Flying Goose Campground in Fairmont, MN after having traversed South Dakota, 350 miles for the day. 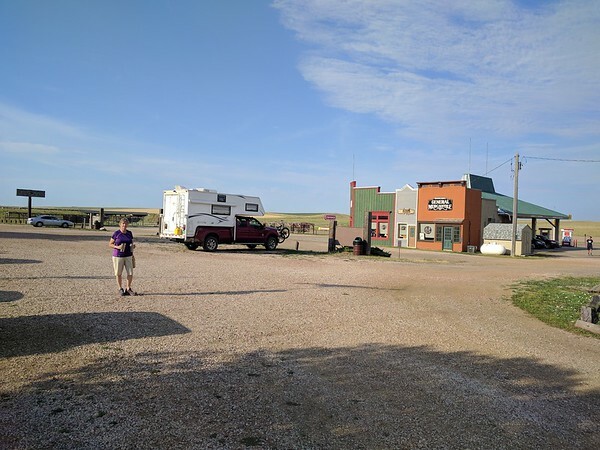 We started the day with breakfast in 1880 Town, SD. 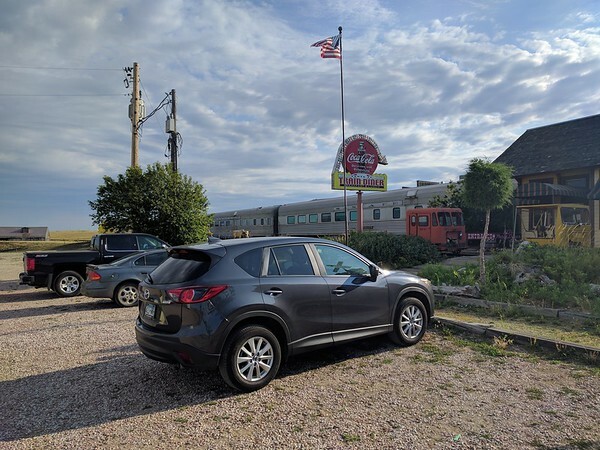 Yes it is a tourist attraction but breakfast in the old rail dining car was great fun. The kitchen and dining cars are real. The entire “town” is a replica of something from the 1880’s. 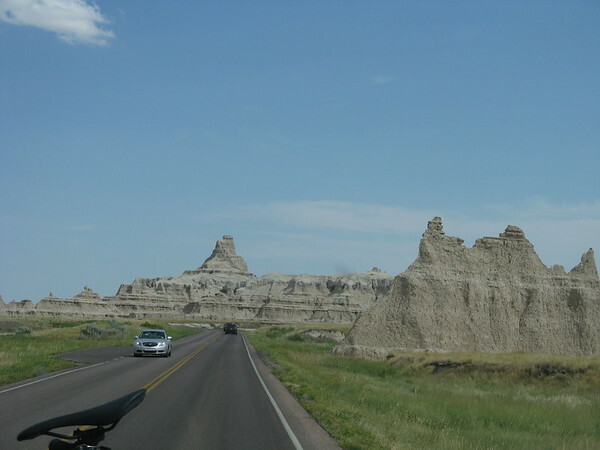 It is always amazing what you can see as you travel about the country. 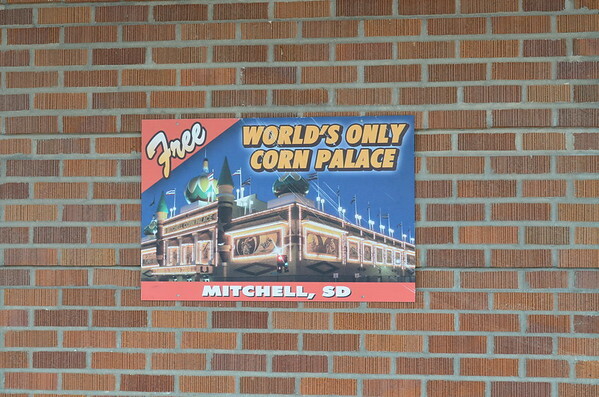 We had to stop for the corn palace in Mitchell, SD. 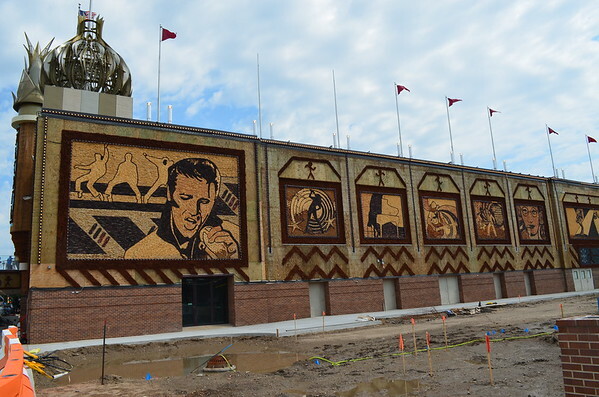 What is a corn palace you ask? Feast your eyes on this. Palatial, don’t you think? 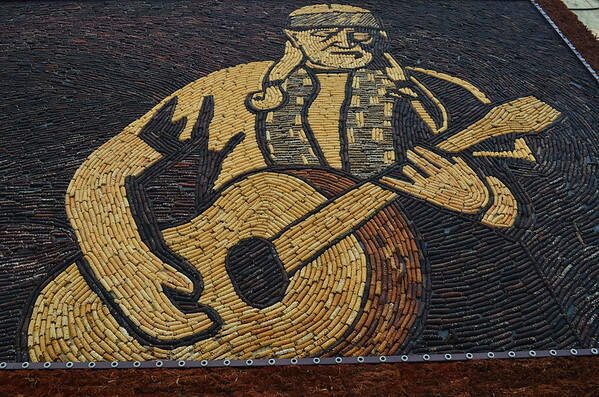 And the artwork is – you guessed it – made from corn. 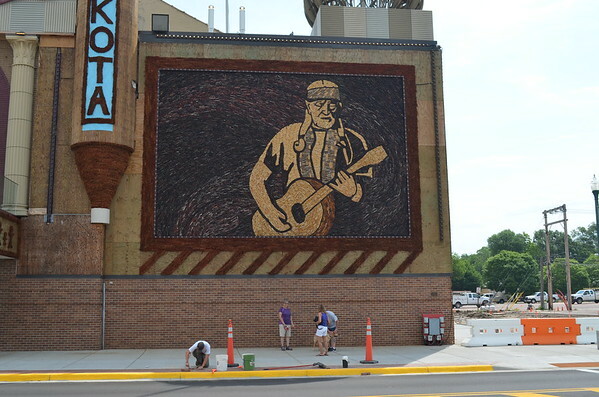 A closer look reveals the artist’s medium, corn cobs stapled to the building. 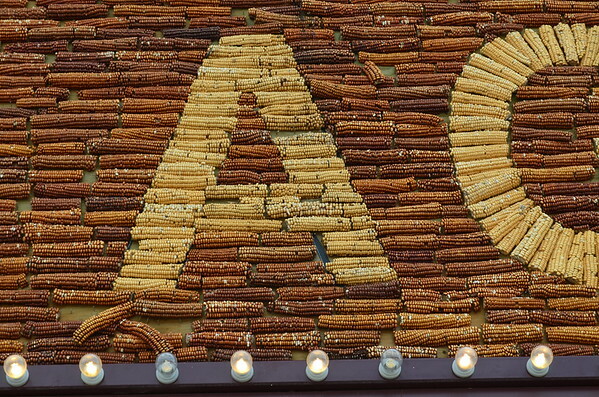 Each year they choose a theme and celebrate it with corn art all around the building. 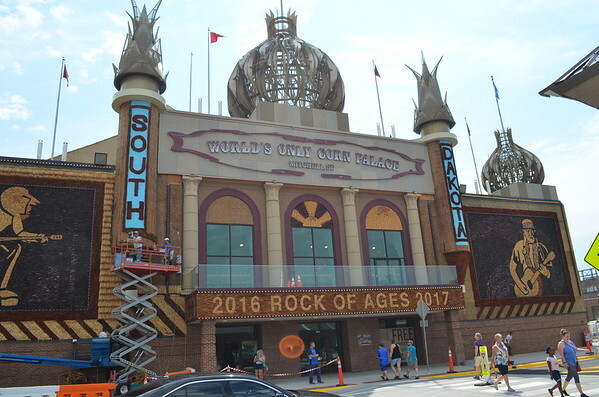 Of course they sell popcorn inside. The tour is free. What you do for entertainment in the corn fields of SD. Along the way you see strange sights besides just corn palaces. A celebration of? Horns? Steers? Who knows, but there it was. We ended our journey here. 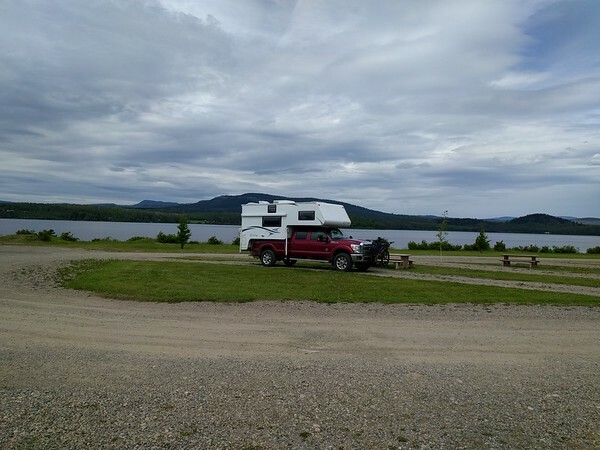 A lovely campground on Lake Imogene. Mostly high 80’s and low 90’s today. Very little traffic, lots of commercial scale wind farms and diesel fuel as low as $2.29. Tomorrow we’ll be in Wisconsin, the other dairy and cheese making state! Our last post seems so long ago, July 4. But sure enough, we have been this long without cell service so I have a lot of catching you up to do. 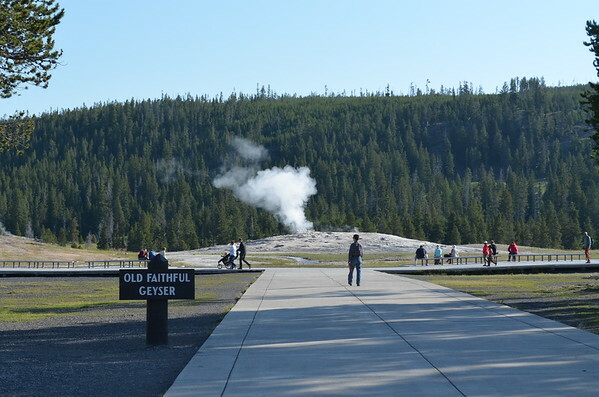 Of course, when you go to Yellowstone you have to see a few of the “must dos” like Old Faithful. 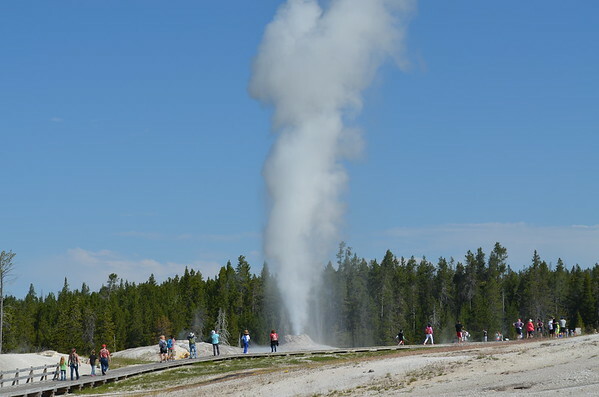 The geyser cooperated and we got to see the full effect. 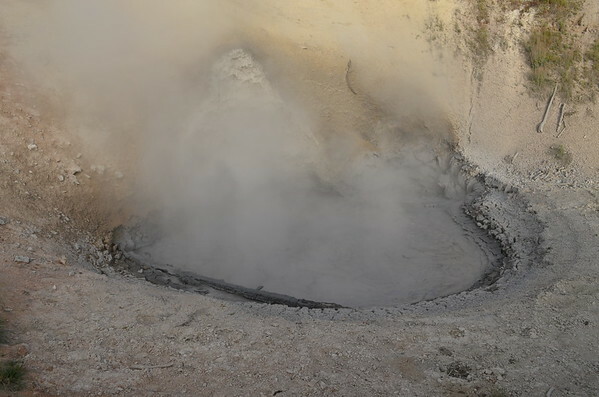 More exciting was the eruptions of Beehive and Lion, two other geysers in the same location that erupt much less frequently and less predictably. One is reminded just how thin the earth’s crust is here and how the landscape is constantly changing as a result of the volcanic action so close to the surface. Lion, another geyser, erupting during our visit. 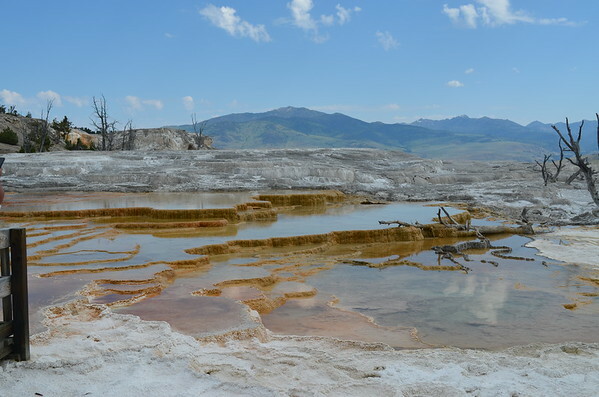 Mammoth Springs is a constantly changing area – the water here was 142 degrees. 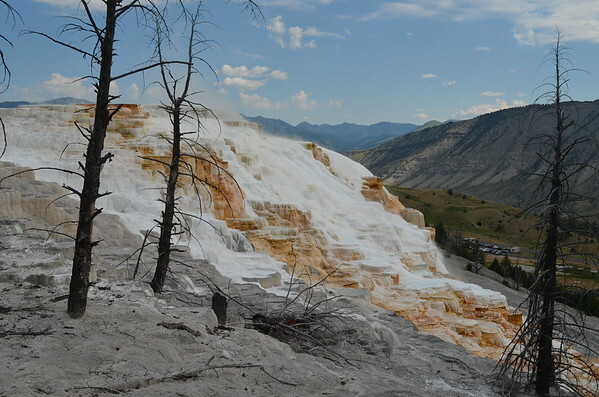 The water can deposit close to four feet of material in a year, changing the face of Mammoth constantly. 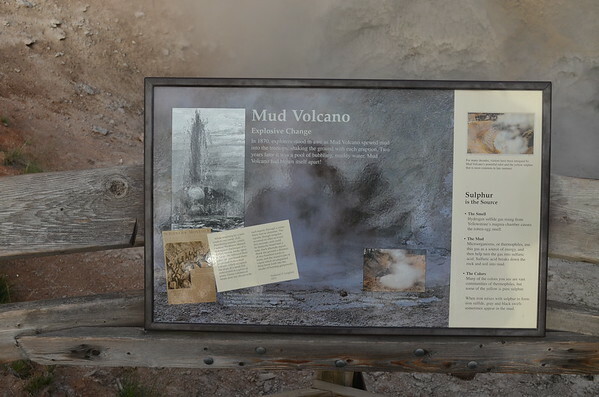 Mud pots and steam vents abound. 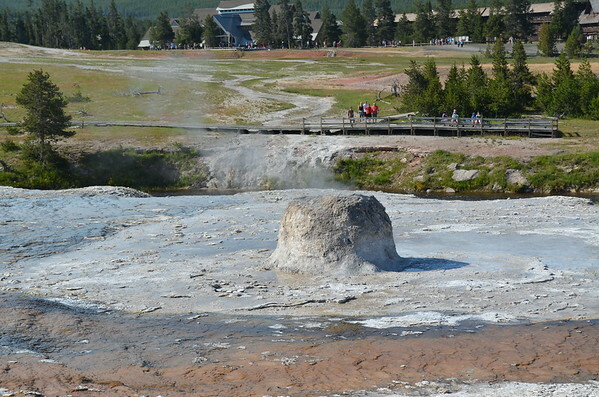 This one was bubbling violently and smelled strongly of sulphur. Our trusty steed in the vapors from the mud pots. 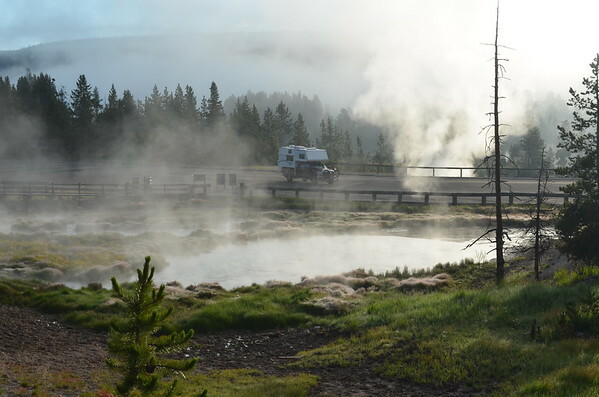 All of Yellowstone seems to be smoking, steaming or erupting. But there are other sights as well. lakes full of ducks and geese with marvelous backdrops. 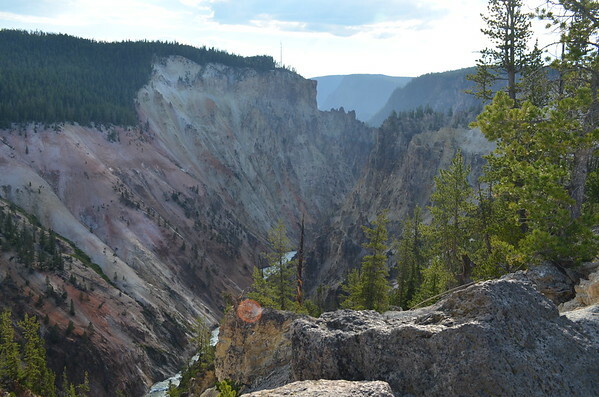 Yellowstone is a unique place. 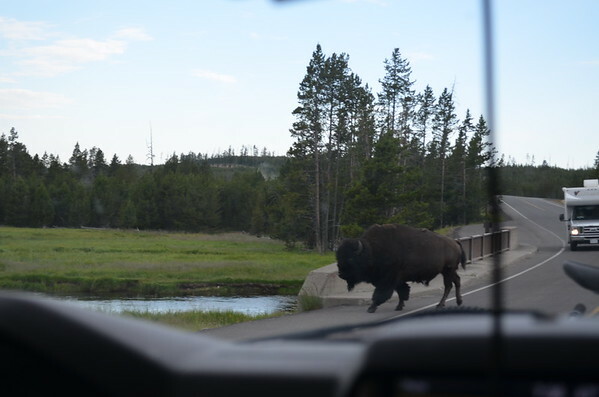 Traffic can be a bit unnerving as people stop in the middle of the road to get far too close to buffalo. I have no idea what they are thinking but one person was life-flighted out while we were there after being gored by a buffalo. 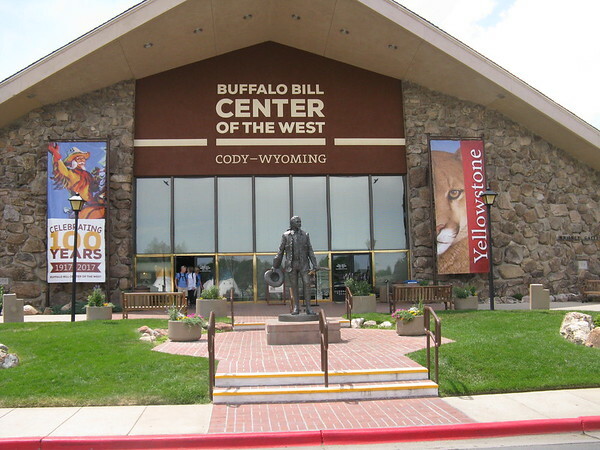 The trip out of Yellowstone took us to Cody, Wyoming for the night. 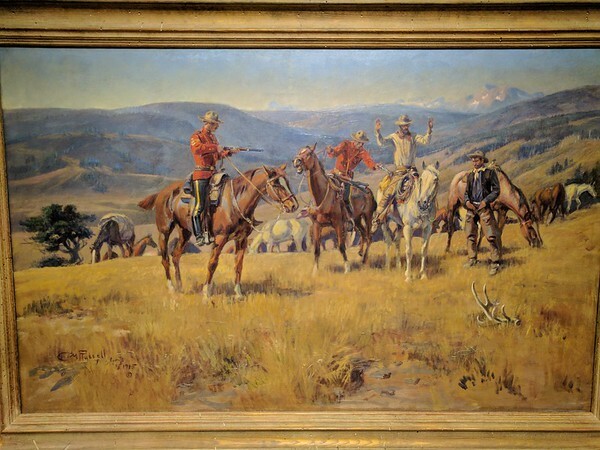 We used our down time to visit the Cody Museum, a fascinating place, well worth a day’s wandering. 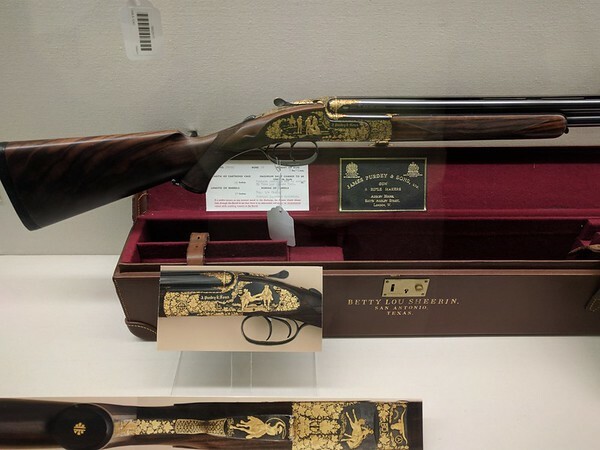 The firearms collection is stunning – so comprehensive and so varied. Gorgeous, one of a kind pieces like this one. and presentation pieces made to presidents, and generals and foreign dignitaries along with historical weapons and weapons of war. An amazing collection of firearms. 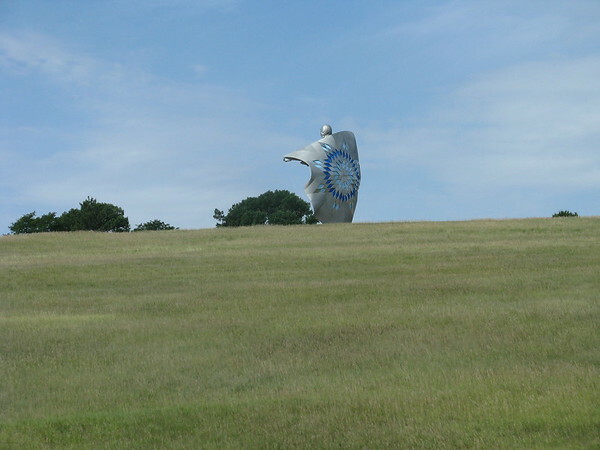 as well as an extensive collection of art. Truly a sacred and special place . 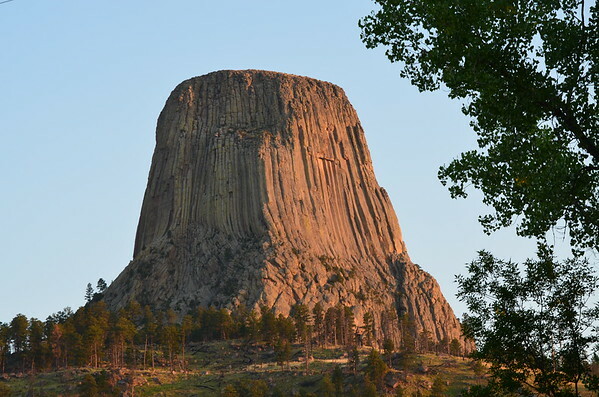 We left Cody for Devil’s Tower where we spent the evening at Belle Forche Campground. This was the view from our camp site for the evening. From Devil’s Tower we passed by Crazy Horse on our way to Mount Rushmore. 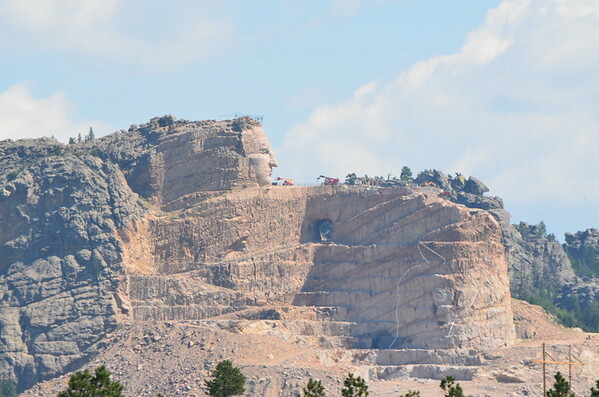 Crazy Horse, still under construction. 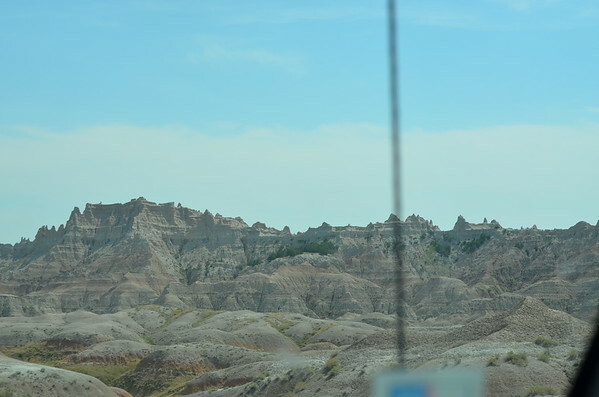 From Mount Rushmore we passed through the Badlands National Park. 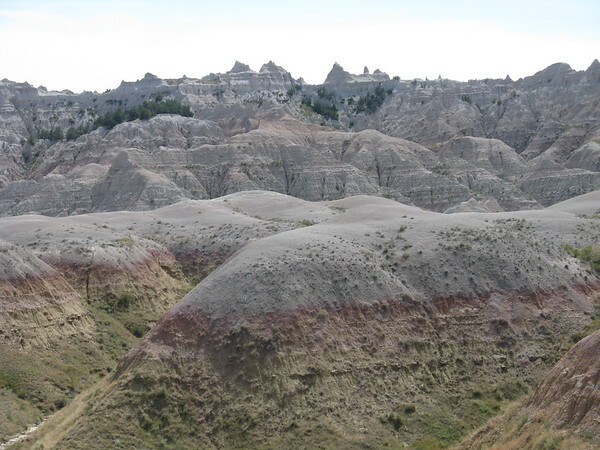 The Badlands is full of color yet it doesn’t capture well with a camera. 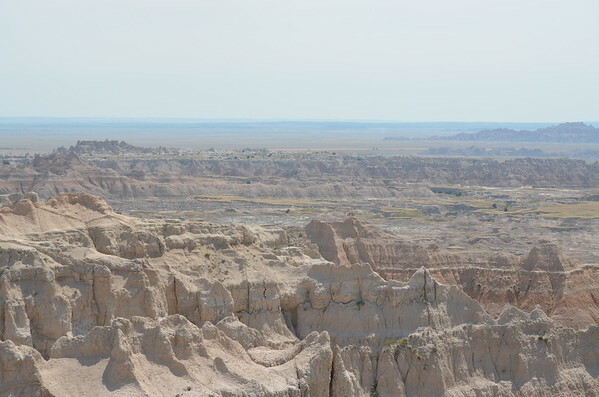 One thing for sure, it was hot in the Badlands today. We are holed up for the night in a KOA with the air conditioner running full tilt. It is a bit after nine P.M. and the temperature outside is still 90 degrees. 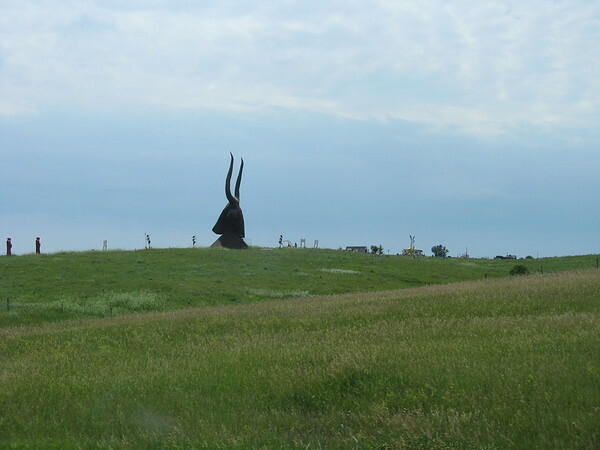 Tomorrow we make a long run for Minnesota, Myre Big Island State Park, where we hope to spend the night. It will be our longest mileage day yet if we make it, 400 plus miles, but almost all of it on Interstate 90. Not a great deal to share since we have holed up in Missoula waiting for our campsite reservations in Yellowstone to open up tomorrow. 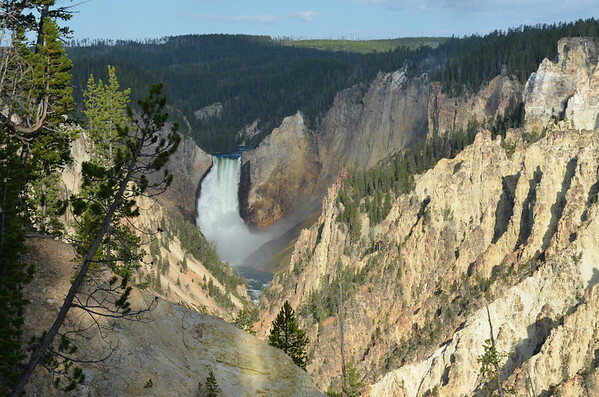 But since we have no idea if we will have service once in Yellowstone, here is a quick update. 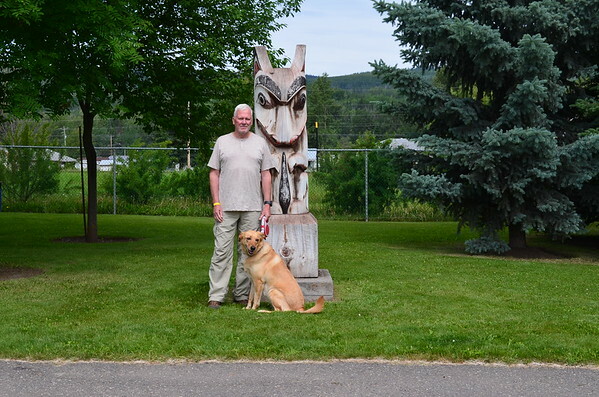 We made a 300 plus mile run from Fairmont Hot Springs in BC to Missoula. That wasn’t the plan but plans change when you are winging it. 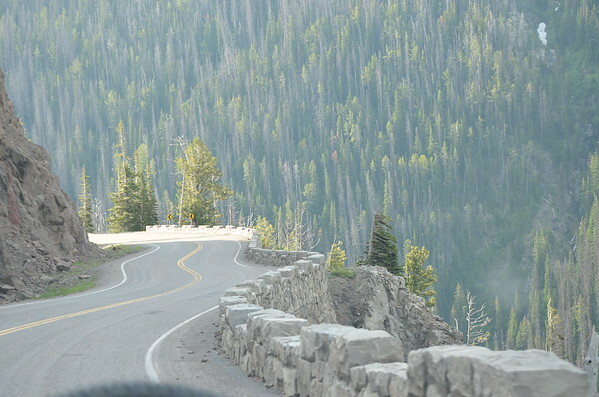 We originally planned to stop in either Glacier National Park or that area, Whitefish or Kalispell. After hours on the phone calling any number of places to camp we discovered, not unexpectedly, that Canada and the 4th of July are prime camping days so everything was booked. We really wanted to find a place we could hook up to power because we are in a bit of a heat wave. Temperatures for the last week have been 10-20 degrees above normal, reaching into the high 90’s. Trying to keep our dog Ginger comfortable while we are out and about is important so being able to run the AC is important and that takes power. After multiple calls we scored a campsite at the Missoula KOA so that is where we are, and have been for the last three days. As we passed through Kalispell we did have one treat. 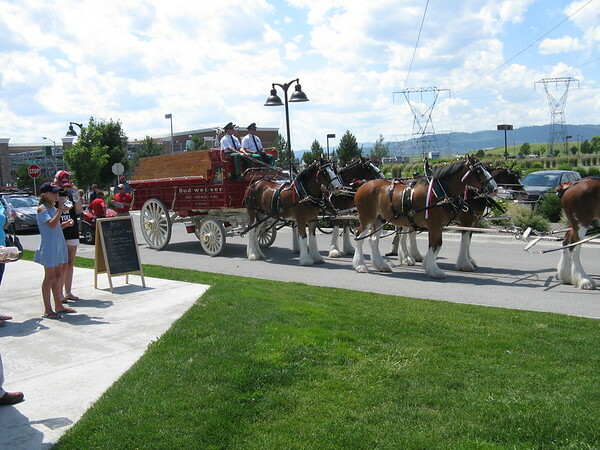 The Budweiser Clydesdales were out and entertaining visitors to Kalispell. 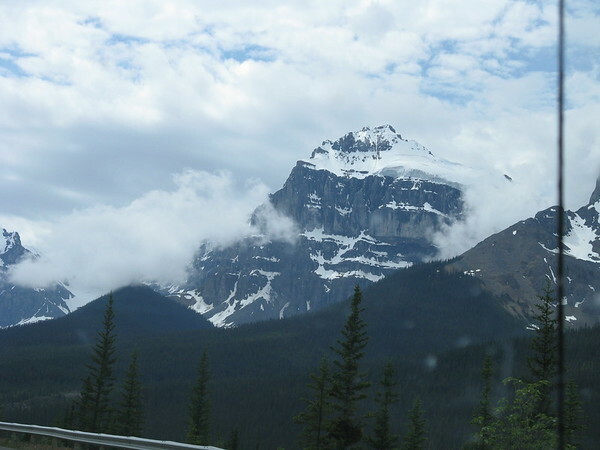 We also got to see lots of pretty scenery on the way down. 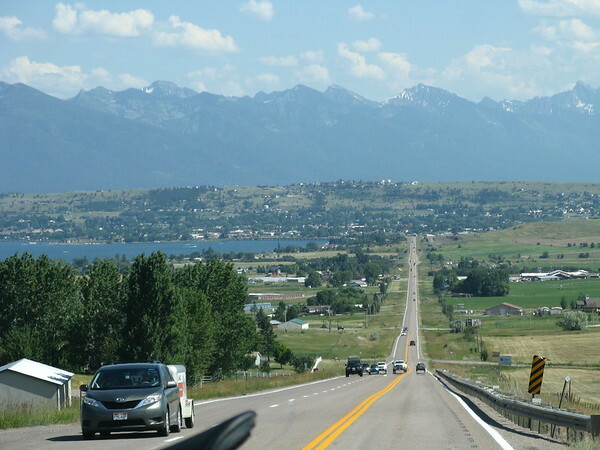 The road around Flathead Lake offered some spectacular views that were hard to get because of the traffic and the 70 MPH speed limits. The roads are also exceedingly straight. The roads were jam packed with people out enjoying the hot weather, water and the weekend. Cars were parked everywhere they could squeeze in and there were tons of boats on this huge lake. 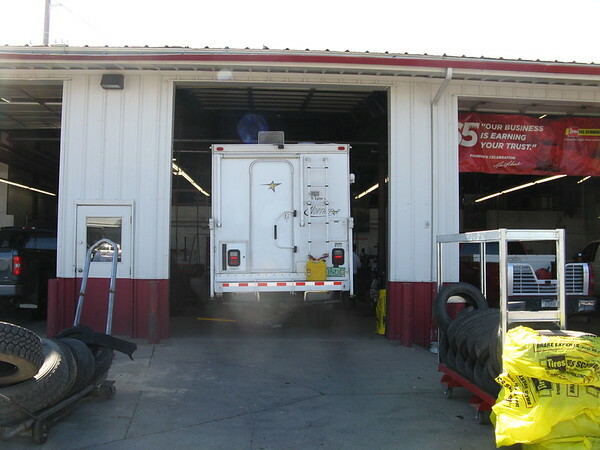 With almost 7,000 miles on this trip so far it was time to rotate the tires on the truck. What a pleasant surprise to find that Les Schwab could get us in on Saturday before the 4th. Just a quick shout out for great customer service. 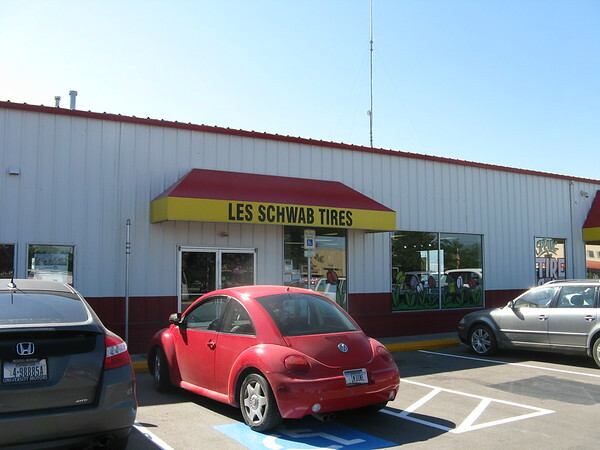 Never been a Les Schwab customer – none in our home area to my knowledge – but they got us in within an hour and wonder of wonders, no charge to the tire rotation. That is what I call great customer service! 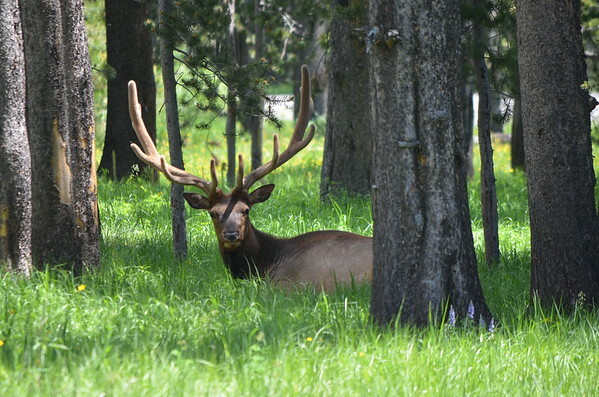 Tomorrow we head to Yellowstone for a week. Not sure what to expect having never been there but we have heard from folks here who were there last week that the bugs are fierce. I can hardly wait! Who knows when the next report will show up but when we have service we’ll bring things up to date. Bye for now. 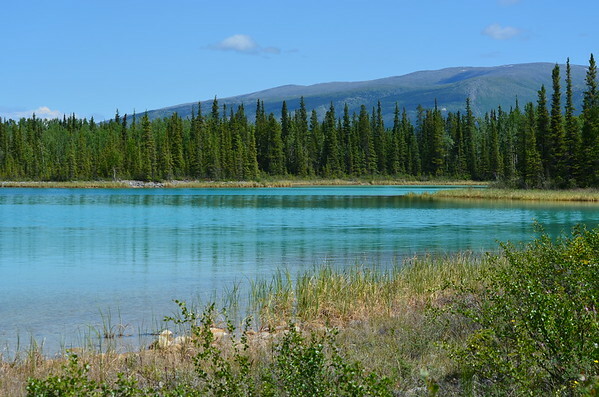 Another lengthy spell in the wilds of Alaska, the Yukon and BC without cell service, wifi or other electronic distractions. We have traveled over 1,000 miles since the last post so I have some catching up to do. 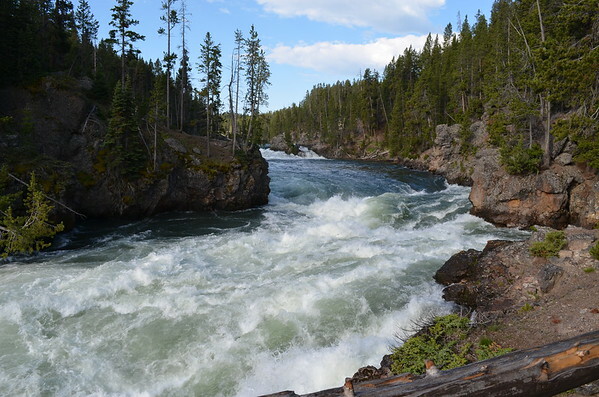 I had reported that when we left Wolf Creek we were headed to Watson Lake. 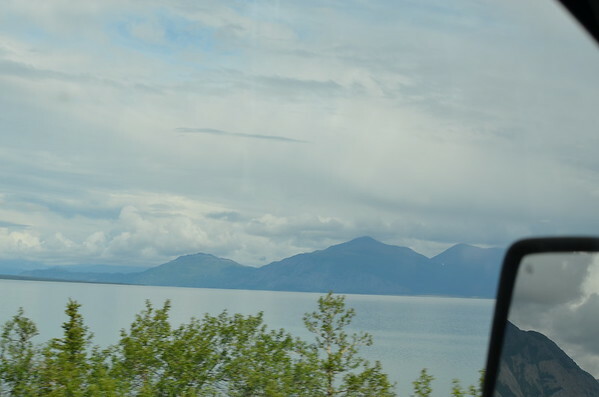 Things change and instead we ended up at Snag Junction, just over the border from Alaska to the Yukon. It ended up being a long 265 mile day because we got stuck at the border crossing for almost an hour. Along the way we saw some big rocks. More mountains and the ubiquitous roadside flowers. 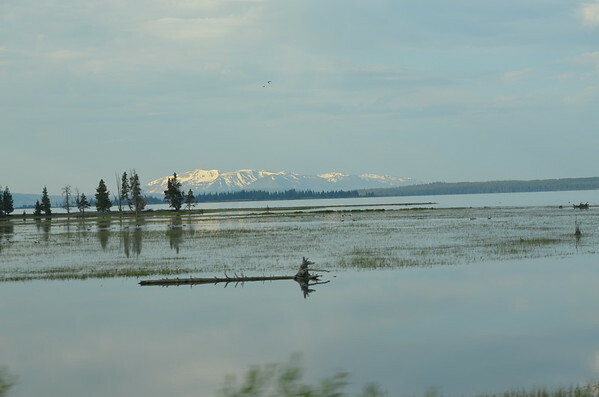 …and many large lakes that are unspoiled by human habitation and pollution. We made some new friends at Snag Junction. 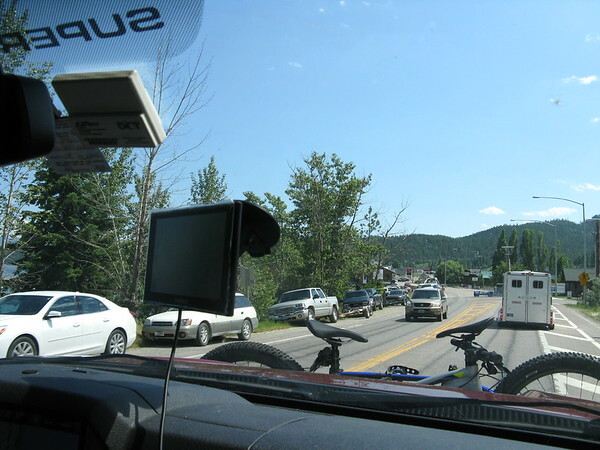 From Snag Junction we traveled 275 miles to Wolf Creek, YT, just outside Whitehorse. This was a lucky find because we got just about the last site that we could fit our truck into. There was a huge graduation party going on and most of the campground was taken by folks celebrating graduation – loud music, karaoke (with lots of golden oldies), and lots of food and dancing. These folks knew how to party and we were thrilled to be at the other end of the campground. We could barely hear them! 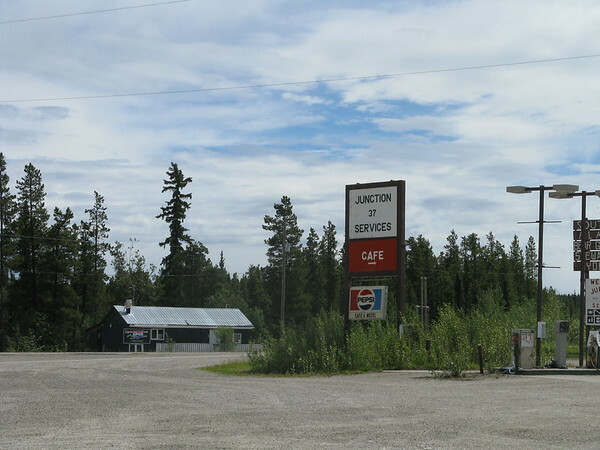 From here we decided to take the Cassiar Highway so we headed east on the Alaska Highway to the junction with highway 37, the Cassiar, where we stopped for fuel before heading down the sparsely settled and service deprived Cassiar. 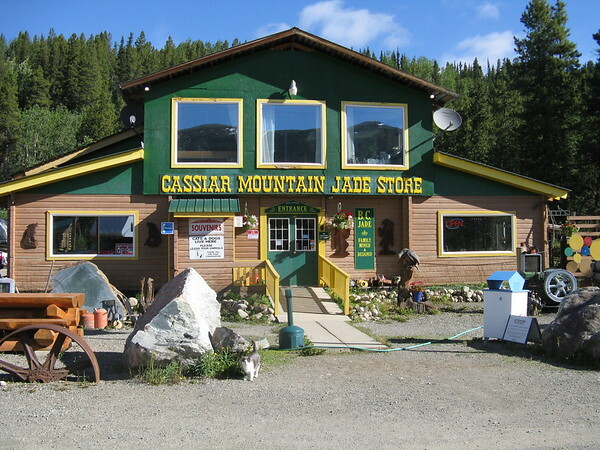 The first, and last, stop for over 100 miles on the Cassiar. 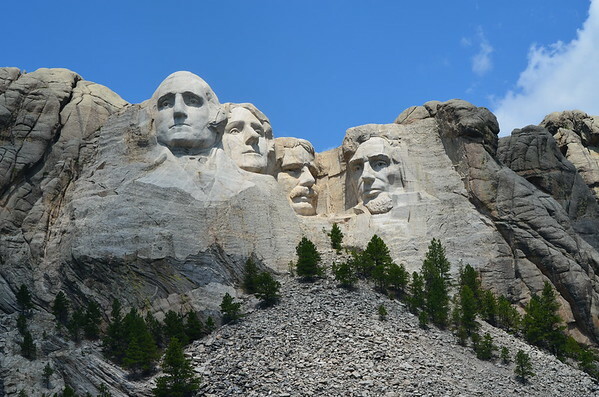 Best to top off here before you head into the boondocks. The gas station attendant, proof you can be mauled by a bear and survive. Great guy, super pleasant and helpful. 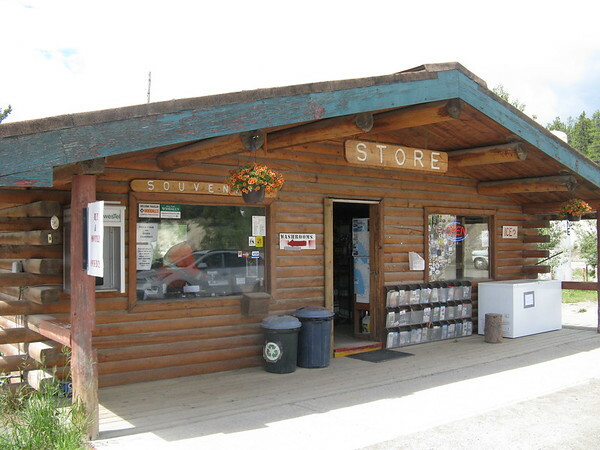 How many gas stations are also log cabins? 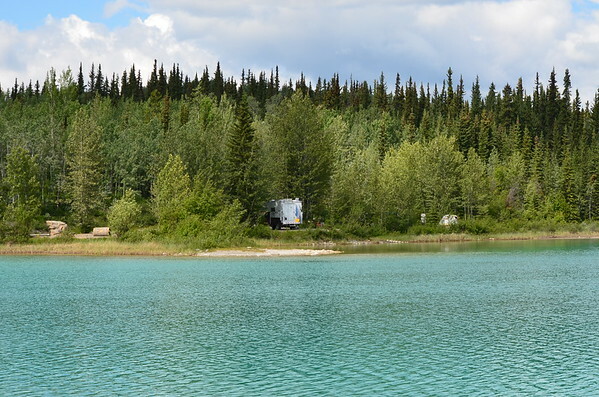 We traveled about 40 miles down the Cassiar and turned into Boya Lake Provincial Campground not expecting much but ready to quit for the day after 302 miles of rainy weather. Did we ever get a surprise. 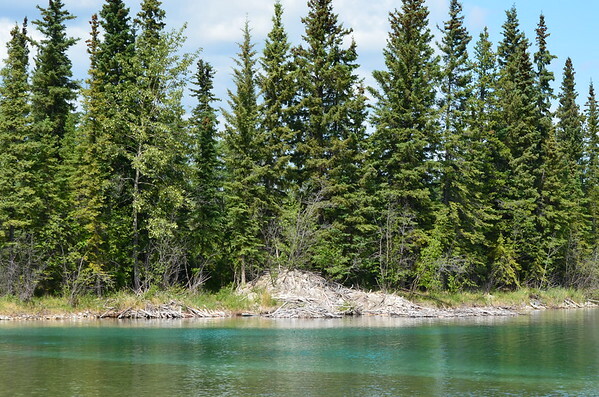 The view from our campsite – to die for. Look at the color of the water. Clear all the way to the bottom. Can you say right on the water? They even threw in a rainbow for good measure. The views were incredible and the color of the water was stunning. There were hiking trails that lead to this engineering marvel. 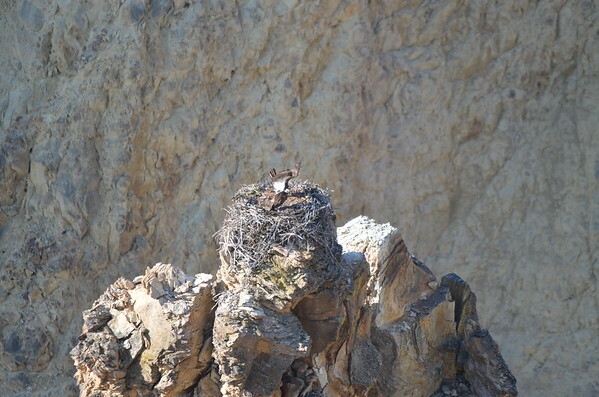 Home sweet home for our industrious neighbors. I think we had the better site. Boya Lake is a hidden gem. We had no expectations and expected to just overnight there. We ended up spending two nights at this beautiful spot. 90% of the world’s jade comes from right here. From Boya Lake we headed south of the Cassiar and made a stop at Jade City, home of the mining operations of Cassiar Mountain Jade. 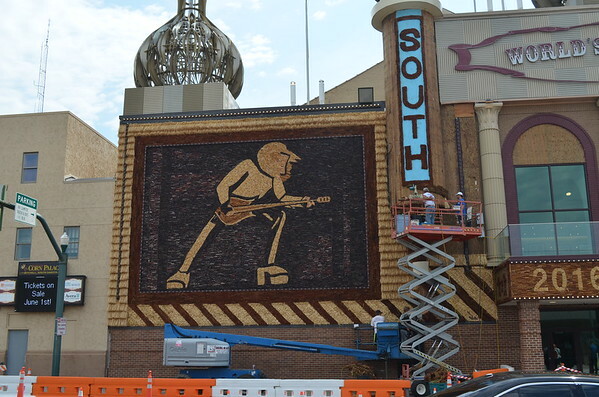 …and this. 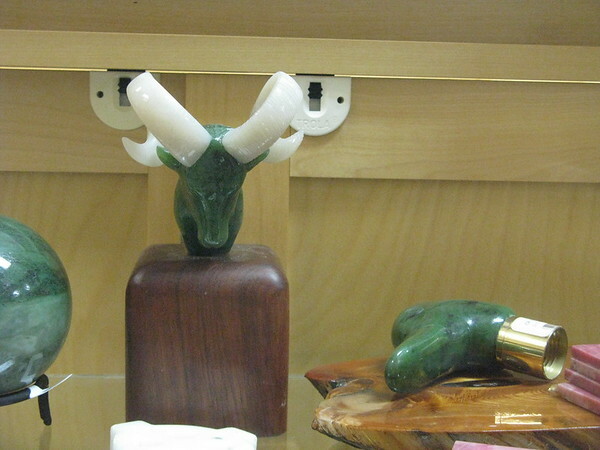 There was so much beautiful polished and carved jade it was hard to take it all in. 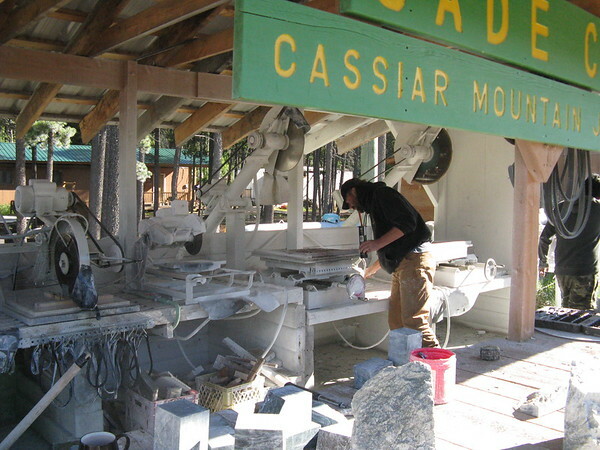 Outside you could watch the local craftsmen turning rough stone into polished gems. Of course we had to contribute to the local economy and buy a few things to bring back home. 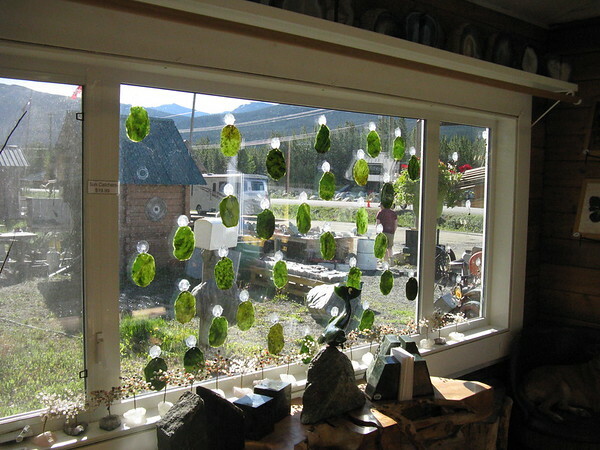 Jade City is also starring in a Canadian Discovery Channel reality TV series (not seen in the US yet) so we bought a DVD just for the fun of watching the show. 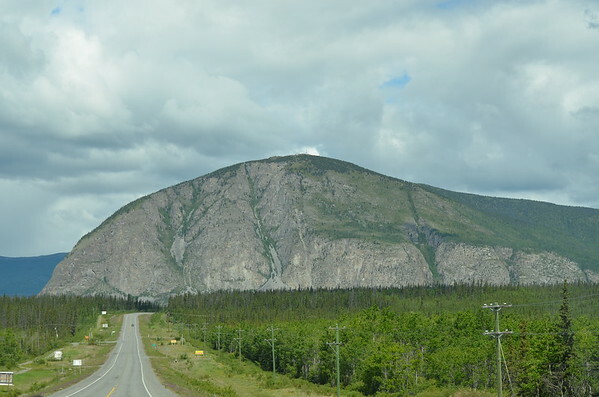 From Jade City we continued on to Meziadin Provincial Campground for the night, remarkable only for the mosquitoes. 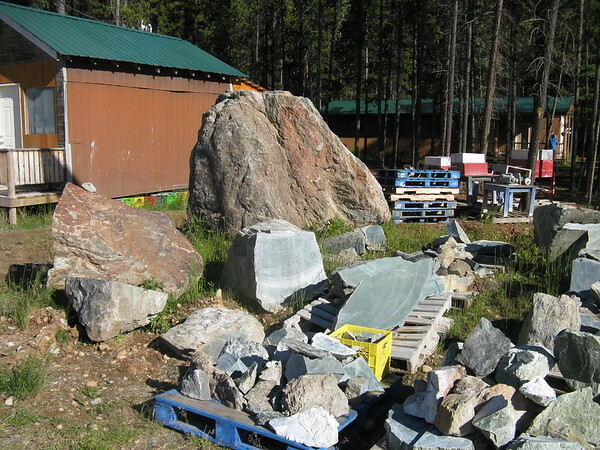 Apparently BC has outsourced management of some campgrounds to private enterprises – unfortunately we found the private operations not up to the quality of the government run camps. 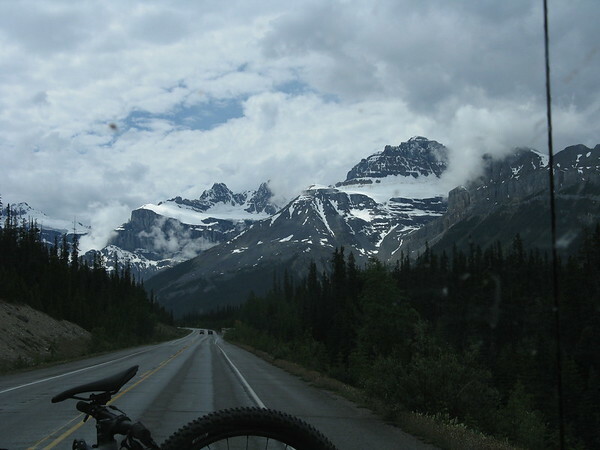 From Meziadin we continued south to the end of the Cassiar and turned east on the Yellowhead Highway, Canada 16. 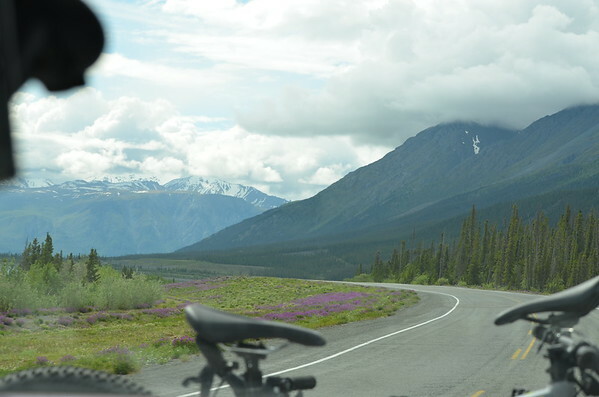 There is another name for this road that evokes more emotion – Highway of Tears. 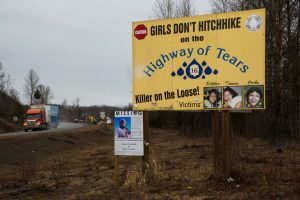 You can learn more about this sad stretch of road here https://en.wikipedia.org/wiki/Highway_of_Tears_murders or here http://highwayoftearsfilm.com/. 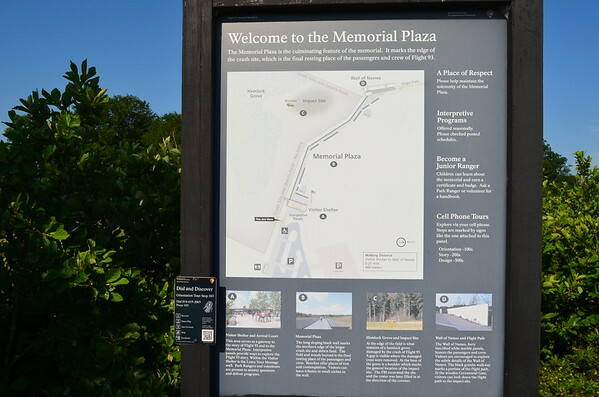 There are billboards along the road, reminders of the tragic history associated with this route. 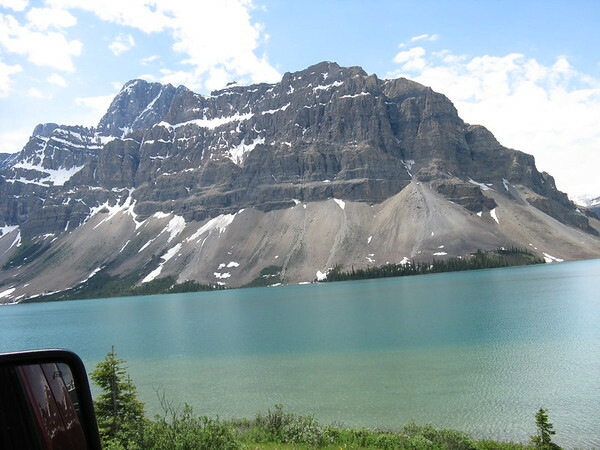 We continued on to Houston, BC, where we stopped for a break and lunch. 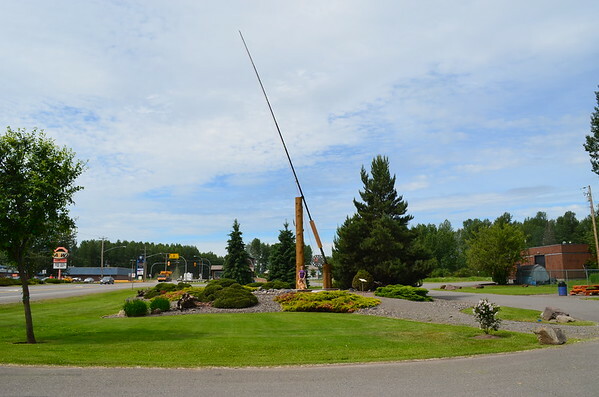 The city intrigued us because it advertises it has the world’s largest fly rod. If it isn’t the largest fly rod it has to rank right up there. The statistics are pretty impressive. Houston clearly takes pride in their local park. 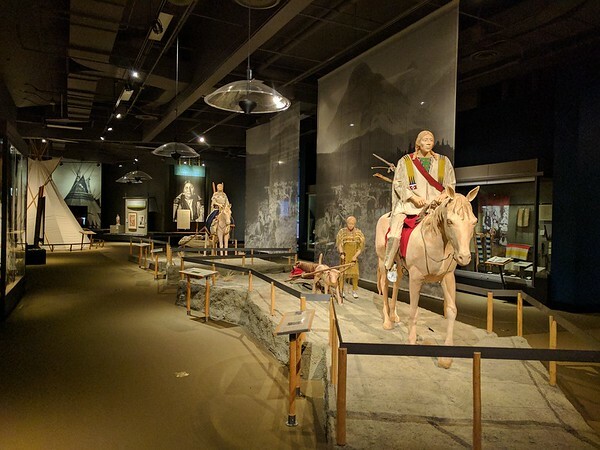 A variety of cultural and artistic items are displayed. 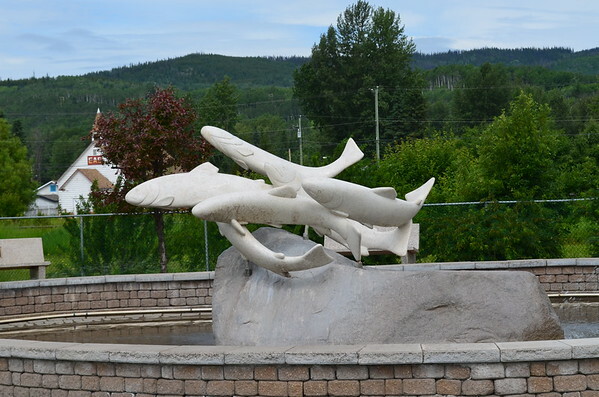 The largest steelhead fishing derby is held here and it is celebrated by this art work in the park. 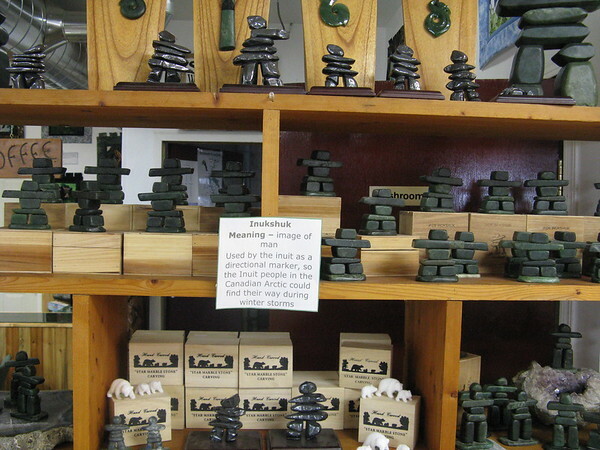 We are constantly struck by the pride these small communities take in celebrating their heritage. We have also been amazed at the lack of graffiti and vandalism in Canada that is so prevalent elsewhere. We ended this day in Fraser Lake, BC after another 300 mile day. 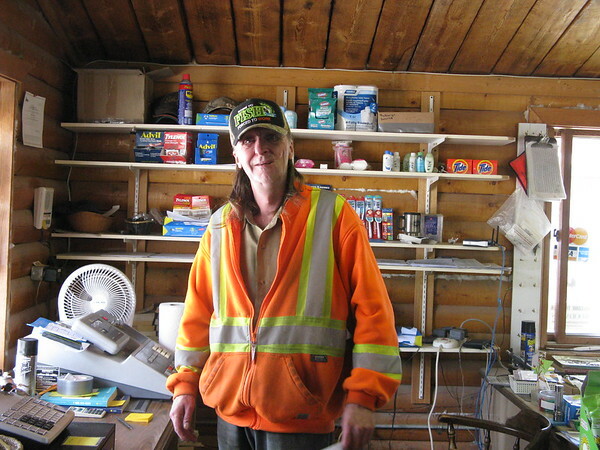 Fraser is another example of the pride and generosity of these small Canadian towns. 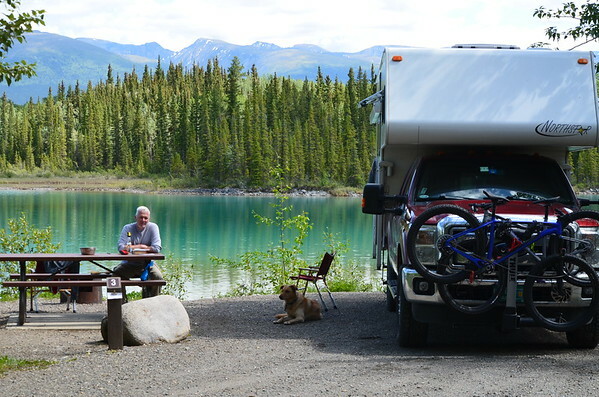 Fraser Village offers visitors two nights of free camping on Fraser Lake at their own village campground. Our free campsite for the night. 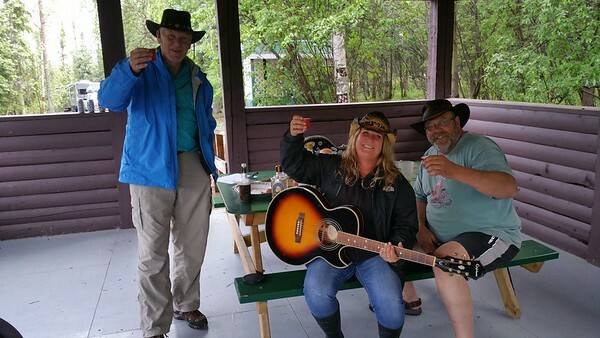 The mayor even came by to welcome us to Fraser Lake and make sure we had what we needed. 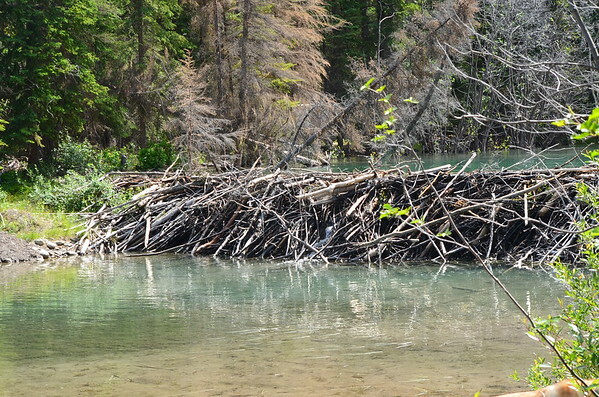 Pretty nice digs for the price – and flush toilets too. 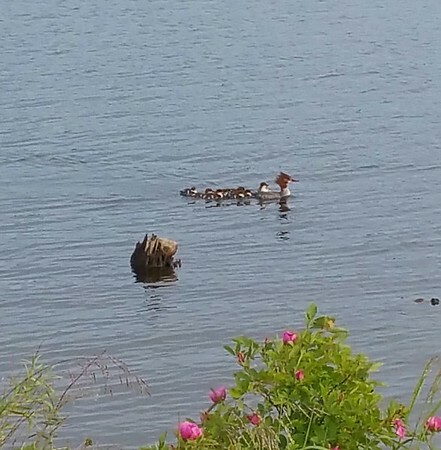 Our neighbors at Fraser Lake – momma and a bunch of babies. 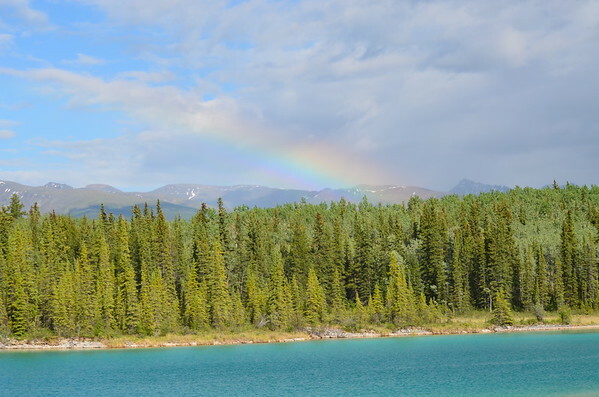 From Fraser Lake we continued on the Yellowhead to McBride, BC and a nice little private campground, Beaverview. 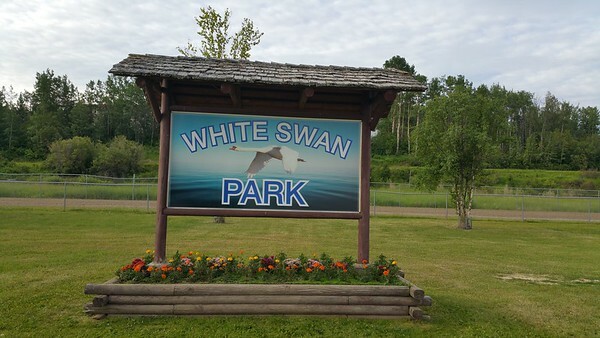 The folks running the campground were very gracious and pleasant – their mosquitoes, not so much. I mention the mosquitoes because we are starting to see a lot more mosquitoes and other bugs as we head farther south and move closer to July. 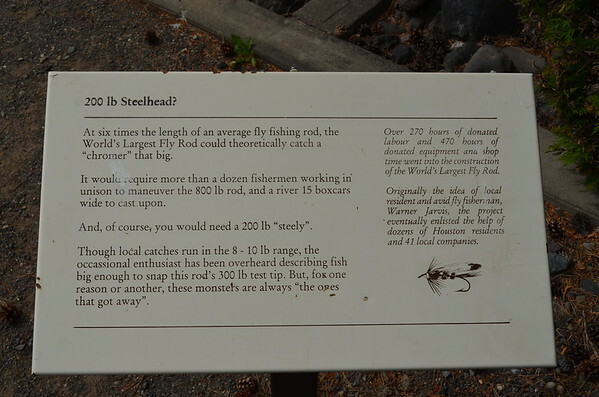 While we were in the Alaska and the Yukon we were essentially bug free but it appears that luxury has come to an end. The truck windshield is now almost opaque at the end of the day and the front of the white camper is almost black from the carnage we wreak on the flying denizens of southern BC and Alberta. 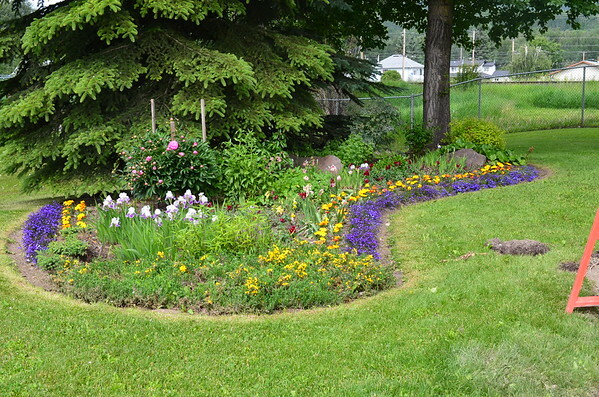 Tonight we have concluded a 353 mile day at Spruce Grove RV Park in Fairmont Hot Springs, BC. 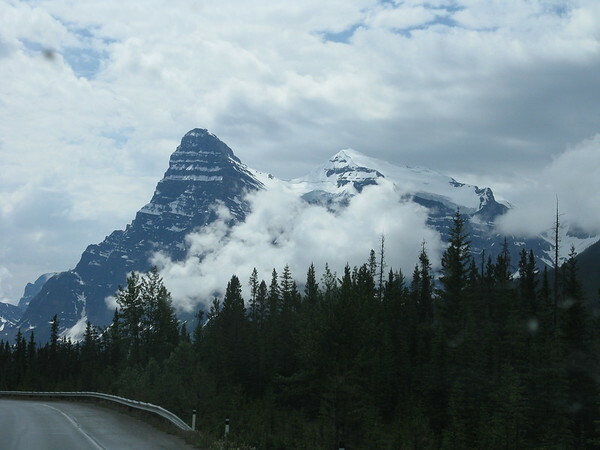 We traveled down the Icefields Parkway, re-tracing our route of some weeks ago in reverse. 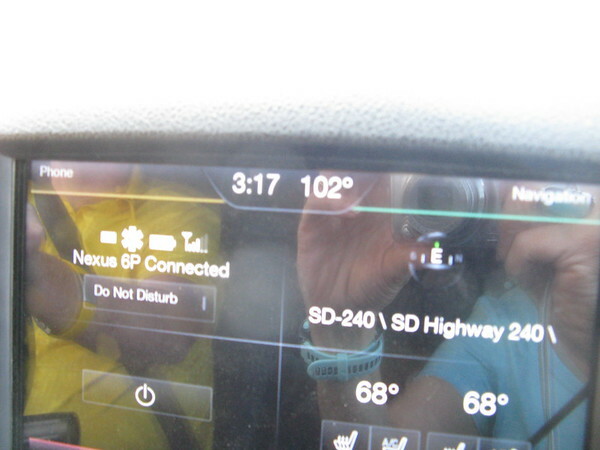 The temperatures were in the mid to high 80’s as we arrived here so we opted again for power and water so we could run the AC and cool down after a long day driving. Tomorrow we will be back in the USA (assuming they will let back in), and probably boondocking somewhere around Kalispell or Missoula, MT since every campground from here to Missoula appears to be full up until after the 4th. 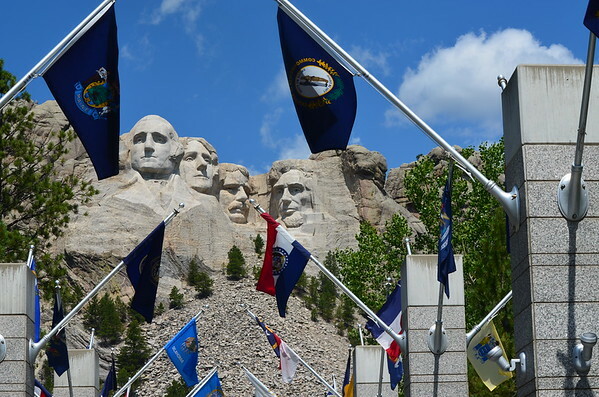 We picked a tough weekend to head back – Canada’s 150th birthday followed by our 4th of July. Happy birthday to Canada and to us!